Mike May at St. Paul’s School invited parents including Dr. Dawn Gretz to give hands-on presentations about the skeletal system, the nervous system, circulatory system and more to students in the Discovery Center during Global Doctors Seminar Week. Later in the lesson, students donned scrubs and clustered around the table while Dr. Gretz taught each one how to use a bone saw and then how to cast the broken leg of a dog skeleton. This lively, hands-on lesson about the skeletal system took place at St. Paul’s School in Brooklandville, Maryland, this March as part of Global Doctors Seminar Week. Organized by Mike May, facilitator of the Discovery Center at St. Paul’s School, Global Doctors Seminar Week consisted of six presentations on human body systems led by volunteer St. Paul’s parents as a culmination to the students’ Level Up Village Global Doctors: Anatomy course. Five doctors and an EMT engaged students in a variety of activities such as the dissection of a (very large) cow’s heart, a virtual tour of a Johns Hopkins operating room while an operation was in progress, and a role-playing exercise to better understand how neurons and neurotransmitters transmit messages. May was delighted to invite parents into the Discovery Center for this series of lessons. St. Paul’s launched the Discovery Center under May’s guidance in 2012 to enhance the traditional academic curriculum of the lower school through inquiry-driven, project-based learning (PBL) in response to a complex question, problem or challenge. 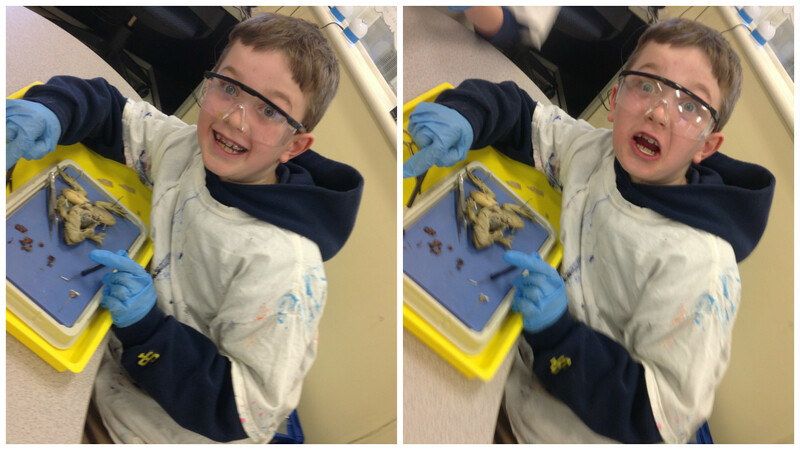 Before…and after he realizes there is an insect inside the abdomen of the frog he’s dissecting! Just one of many memorable moments in Global Doctors: Anatomy at St. Paul’s School, MD. St. Paul’s School is committed to educating students of character and integrity who are motivated lifelong learners prepared to succeed in today’s complex world, explained May. To achieve that goal, the School has identified several areas of strategic priority, including global education. The school partnered with Level Up Village starting in the fall of 2015 to bring global collaboration to the Discovery Center with courses such as Global Inventors (3D printing), Global Video Game Designers and Global Doctors: Anatomy. Students learned to cast a broken bone on a dog skeleton under the direction of parent volunteer Dr. Dawn Gretz during Global Doctors Seminar Week. In all their Level Up Village courses, students at St. Paul’s School follow the same curriculum and exchange video messages with global partner students to share what they learned, while asking questions about daily life, hobbies and popular culture in each other’s countries. St. Paul’s School also helps sponsor STEAM education in the developing world through Level Up Village’s Take a Class, Give a Class model: a portion of tuition is used to donate the same courses and all supplies to the global partner organizations. During Global Doctors Seminar Week, May took the global exchange one step further. He made a video of each parent presentation on human body systems so his students could share the entire experience with their global partners at RIC-NET in Ghana. What a great way to ensure students on both ends of the course could benefit from these wonderful parent presentations! 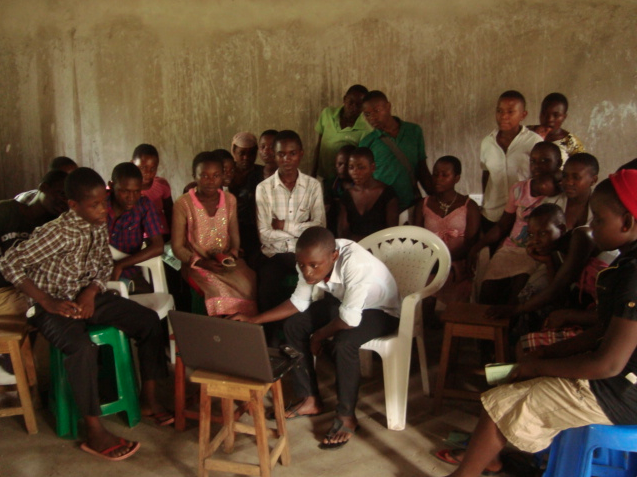 On the other end of the Global Doctors: Anatomy collaboration were students at RIC-NET in Ghana. They followed the same curriculum and exchanged video messages with their partners at St. Paul’s School in MD throughout the course.